The past snowfall gave us a grand depth of a bit over two feet. That exciting event included hours of shoveling and roads that were pretty much closed to driving for a while. I wonder why we “dig” dirt and “shovel” snow? Hmm…I remove the dirt from the hole and remove the snow from the walk. Yep, it’s the same thing as far as I can tell. Both activities use the same tool and make my back tired. Our yard now has deep three-foot deep trenches dug out and shoveled clear by me that lead to all the important locations. Basement door to chicken coops, front door to the car, and car to the road; however, I also made trails for the feral cats so they can come to the door for the food we leave them. When the days of soft, cold snow finally ended, everything quickly warmed up and a suddenly a thick, damp fog settled in. 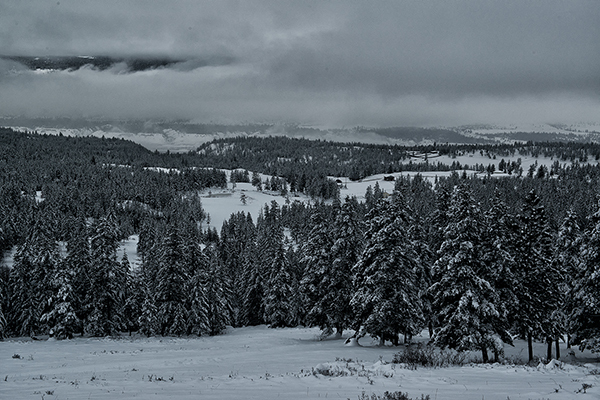 My first thought was to get out my snowshoes and head up into the hills surrounding our home. I mentioned that to my wife, but not in the mood for trudging through the snow she suggested we get our cameras and go for a drive around the now foggy neighborhood in Pritchard instead. So we bundled up, grabbed our cameras and took off. Our car is perfectly equipped for photography with beanbags. Just set them in the window and nestle the lens on them to reduce camera shake when using our long lenses. However, on this day my wife set aside her 150-500mm, and decided her light weight 70-300mm would be better suited for the foggy landscape, and I chose my 24-70mm. But it’s good to always have the beanbags in our car even if we don’t need them. Fog is a tricky business because contrast is all but lost and the moving mist reduces sharpness. Everything is so flat that it’s hard to get definition. I enjoy fog and recall the imagery of a poem from Carl Sandburg. I think that description is pretty good and I enjoyed how the fog obscured my view of things in the distance and created a mystical looking world as I drove along our snow covered rural road. Years ago when photographers were making exposures of foggy landscapes with film the best way to increase contrast was to use yellow, orange, or sometimes red filters. We could also over-develop the film, or as a last resort process it in hot chemicals. There were also filters that could be used while printing to reduce the tonal values, and some specialized chemicals would help also increase the contrast. All that was lots of work and if you screwed up the negative…well, you were screwed. Today we have software like Photoshop (and lots of other programs available that are just as good) to help us out in those flat, foggy conditions, and when Linda and I drove off into the whispering fog I knew I would be spending a short time sitting at my computer increasing the contrast and reducing the grey tonal values. It is now all so easy and it doesn’t take much time. As I sat manipulating the hazy images I thought about all the hours I used to put into producing our photographs. We have it pretty good these days. Fog is fun in which to shoot. All one has to do is find subjects that are distinctive enough to be understood through the quietly creeping and silent fog. My suggestion is instead of drinking your chocolate and staring out the window on the next foggy morning waiting for the sun to come out, get your camera, go out, and see what you can do. 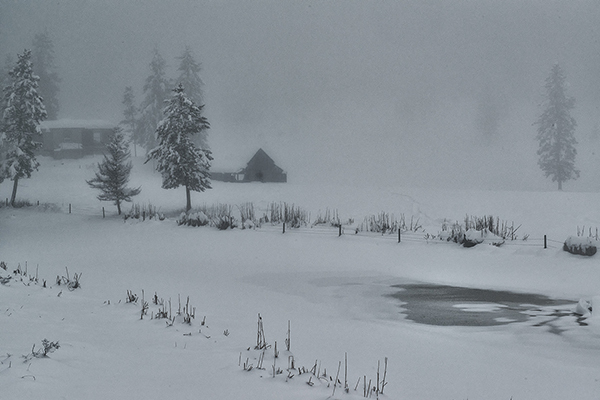 This entry was posted in Photography and tagged 24-70mm, 70-300mm, british columbia, Carl Sandburg, Cold Weather, digital cameras, Fog, John Enman, landscape, photography, Photography in the Fog, pritchard, snowfall. Bookmark the permalink. Make yer own. Construct some kind of soft material bag. find some old beans. I used some lentils my wife was throwing out. Put them in an old bread bag, and tied it up with the wiry thing that came with it. then I stuck that inside a cloth bag and sewed that up….. Have fun! What different climates we live in! It was 35°C the other day here (95°F) and the only way I see snow is if I travel to see it, except for the rare day on the rare year. Photoshop and Lightroom are always useful but I have personally found that with fog and snow, especially in low light or falling snow, I prefer to have a very light touch to retain the fragile softness. I expect you don’t need to spend as much money on sweaters as I do Murray. Oh, I punched those images up. There was some breaks, like the horse, owl and higher than the clouds view of Pritchard. 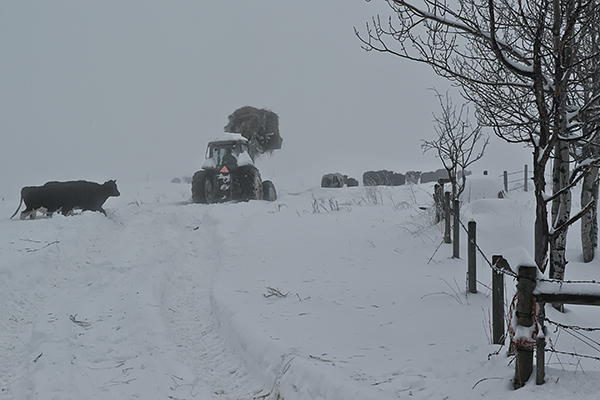 However, the farm scene and cows following the tractor were hardly visible and not worth viewing in original form. Focusing was a struggle..we would keep searching for something in the scene that we could focus on. Manual focus wasn’t any help. Glad ya like my images Smackedpentax. 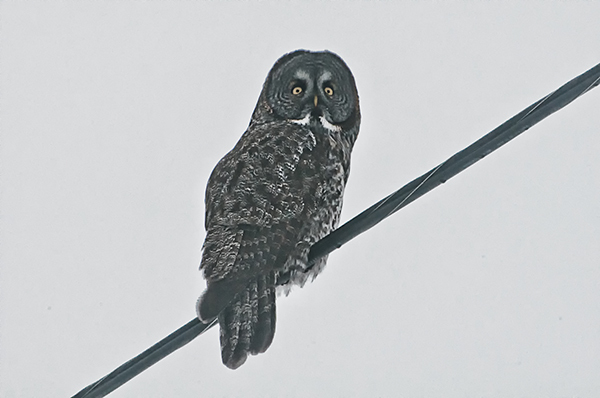 (opps, the owl was by my wife) It was finally warming up a bit, and getting jsut below freezing. I love the picture of the horse. Thanks Martin, It was just posing there. Now I am hoping it wasn’t stuck in the snow. Thank you Alison. AS I wrote, I really like the fog. I better give credit for the owl to my wife. She made me stop for it. ahh…of course you’d like the horse. Did your ears ring today? 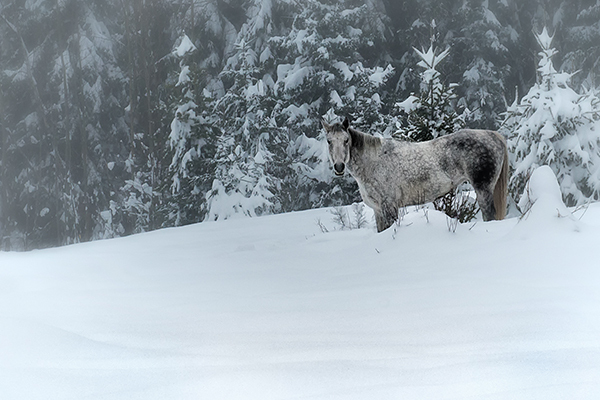 I was talking with a woman that has been trudging thru the snow trying to photograph some timid free range horses. I talked about some things you wrote about your experiences and your super images…I will be sending her your blog. beautiful photographs especially the owl and the horse. Thanks fragg…That damn owl didn’t care if we were there. I had time to position the car sideways (completely blocking the road) so my wife could shoot without bothering to get out of the car. I didn’t realize I challenged you…However, I am looking forward to more examples (is creations a better word?) of compositions that are about, or include icicles. I can’t wait!! Love the composition on the farmyard along the creek! Thanks Rick, Thats my favourite also.